A clean and very useful icon set designed by www.doublejdesign.co.uk. I made this map with NovaMind. This set is named “Origami” and it is a set of 15 free icons for your mind mapping and other desktop/web applications as well as print design use. All icons are completely free for both personal and commercial use. Resell and distribution is not allowed. The icons are available in 5 different sizes (16px, 32px, 48px, 128px, and 256px) and come as Windows ICO and 32-bit PNG files. The icons are also available in vector format (Adobe Illustrator AI format). Very nice. And thanks for stating my site. I am pleased that my stuff is useful. Thanks. 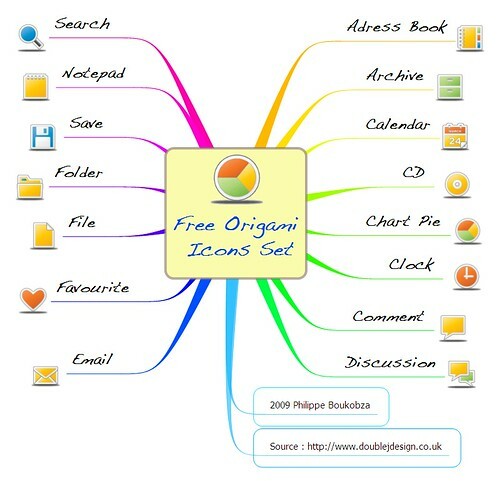 Thanks Jack, your Icons are great and work very well with mindmaps. I’m somehow astonished to come across such a beautiful collection of pix on the site.There are sadly not actually many resources of that kind in the net.